Fair Saturday draws those against new turbines. Cars parked along the length of Rocky Ridge Road and a steady stream of people come in and out to hear from the various speakers at the wind fair Saturday. Matthew Preedom, photo. 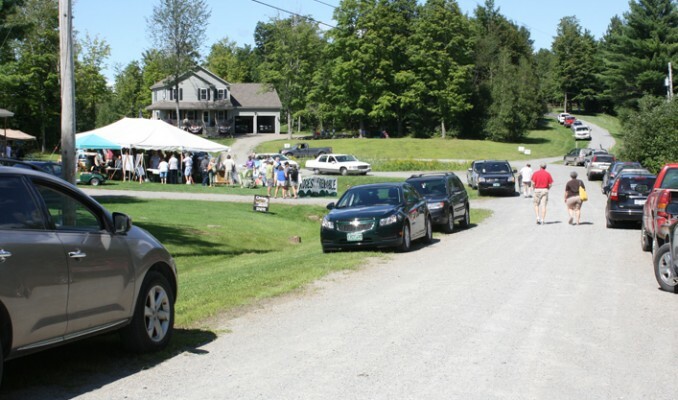 About 150 Swantonians flocked to Rocky Ridge Road Saturday to hear from several people who have lived with and oppose wind energy projects throughout Vermont. The presenters came to Swanton at the request of Christine Lang, the organizer of the event, who reached out to Annette Smith of Vermonters for a Clean Environment for help in raising awareness about what she believes are the potentially harmful effect Swanton Wind may have on its neighbors and the environment. “We really wanted to get the word out,” said Lang, who has made the rounds to town selectboards and the planning commission in an attempt to stave off development of a 20 megawatt wind project on the ridge overlooking her home. Lang said that the event was intended to bring people together to hear from those who live near similar projects Georgia, and Lowell, Vt. Those speakers in Sheffield, said Saturday that they have been living with, and fighting against, wind turbine development for years. The Wind Fair was sponsored and organized exclusively by opponents of the project. Swanton Wind was not invited to bring its own experts to speak to these subjects. Iarrapino also noted that www.swantonwindvt. at com/permitting, there are links to a number of independent studies and factual information about the proposed project. Of the 11 homes on Rocky Ridge Road, seven have for sale signs on their lawn. Only two of those are actively marketed however. Lang and her remaining neighbor’s have “For Sale by Owner” signs on their lawn. “If somebody offers me a good price, I’ll take it,” said Ed Ferguson, one of Lang’s neighbors and an opponent of the project. “No, I don’t have [the house] listed with a realtor. Who’s going to buy it now anyway? Several tables were set up under a large tent on the lawn of one of the homes on Rocky Ridge Road. At the tables sat people from various organizations and neighbor groups that have vociferously opposed the development of Wind Projects. Beneath signs stating “GMP: Braking the Heart of Vermont” and “Sacrifice Water Parks Not Mountains!” sat Robbin Clark and Carol Irons of Lowell, Vt. Irons was one of 12 arrested for trespass during protests at the Lowell Mountain site, but the prosecutor later dropped the charges. Others spotted at the fair included former Republican gubernatorial candidates Randy Brock and Brian Dubie, Swanton Representative Marianna Gamache and Annette Smith, a controversial figure in the debate surrounding Vermont’s energy policy. “What we’re seeing in Vermont with the rush to develop renewable energy is pure, unadulterated greed. These projects neither create or protect a healthy environment and they are forced into our communities over our objections,” she said. Smith said that she will not support any wind development outside the small, net metered projects that may be seen on farms and homes. But even those, she said, present many problems for neighbors. “The technology is not good enough,” Smith said. “We are simply throwing people away, sacrificing them, as we figure out how to do this. The Public Service Board knows that it is not using the right standards to evaluate the safety of these projects, it ignores intra-sound which is the drumming that really disrupts people, and sets up bogus assumptions about noise levels inside homes. “Our government and our legislatures are captured by the industry and are promoting projects that do nothing to protect our environment.” intermittent Smith said that the nature of wind and solar generation, coupled with the human costs inflicted on neighbors, and the sale of the project’s renewable energy credits (RECs) out of state, does harm to Vermonters without solving any of the problems the projects are supposed to solve. According to Smith, intermittent the nature of wind generation means that utilities have to keep “an entirely redundant system” of gas and coal generators to turn on whenever the wind isn’t blowing. “The emphasis on carbon dioxide pollution is distracting from the larger pollution problems in our world,” Smith said. “Chemicals pollute the ground and our water. Smith said she advocates an energy strategy that focuses on Vermont only and would use small solar and hydro generation to meet the state’s needs. Lewandowski said that these renewable facilities really miss the point and will do nothing to reduce carbon dioxide emissions. “In Vermont, home heating and transportation are the biggest polluters,” he said. “Vermont’s electricity is already very clean, coming mostly from hydro, nuclear, and the renewable projects already in place. Brian Dubie lives on the eastern side of Rocky Ridge on Fairfield Pond where his family has lived for generations. He came to the Wind Fair to learn about how the project might affect his family, and what he can do about it. “What we’re hoping for is that Swanton Wind will decide not to move forward with this project,” Annette Smith said. “If Travis [Belisle] does this, these poor peoples’ whole lives will be disrupted for years.